In today’s social world, a quick and effective apology is a company’s best strategy for damage control after committing an error in customer service. Here’s a great example of such an apology I received from 48hourPrint.com. 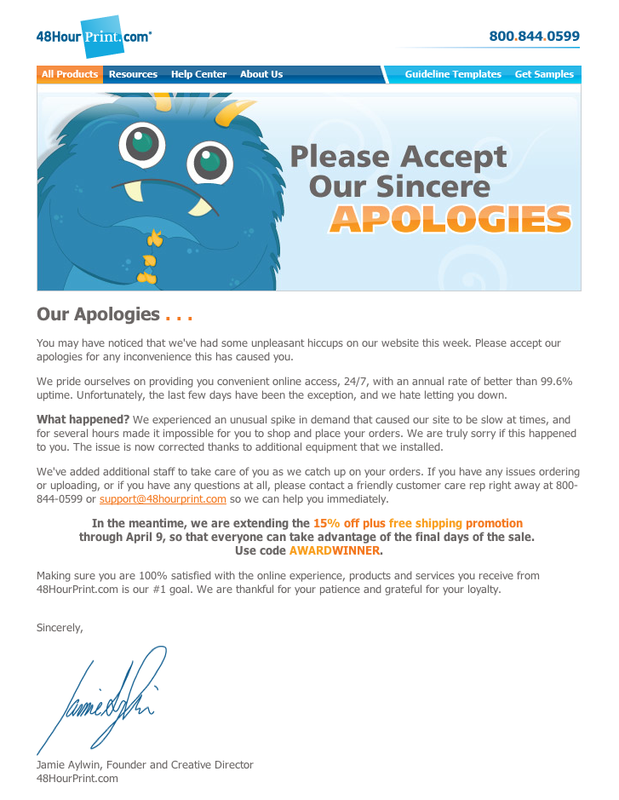 Not only did they manage to apologize and make things right with a 15% discount and free shipping, but they also subtly communicated that their company’s services are in demand. Genius! Also of note: they clearly explained what happened without excuses and communicated how they are fixing the issue. The cute little monster doesn’t hurt either. Well done, 48hourPrint! This entry was posted on Tuesday, April 3rd, 2012 at 3:09 pm and is filed under Business Practices, Marketing your Business. You can follow any responses to this entry through the RSS 2.0 feed. You can leave a response, or trackback from your own site.